George Crezee of Big Bear Lake successfully completed 61 sporting events within a 24 hour period in celebration of his 65th birthday. He started at 3:15 am on Wednesday, April 1st (no joke!) and completed his activities around 3 am the next day. His activities literally took him from the mountains, to the desert, to the beaches and all around Southern California. George set out to accomplish as many sporting events as he could in hopes of encouraging others to become active. “If a 65-year-old can go out and do a pile of active-lifestyle events, then other people can at least start walking their dog around the block,” he said. Crezee is an accomplished ski racer who has pursued countless sports all his life. He ticked off 26 sports with which he marked his 60th birthday and has tried many of the activities he attempted Wednesday at least once before. “He does all kinds of sports – all of them, really well. No fear,” said his friend John King, a 72-year-old Big Bear resident who ski races with Crezee. 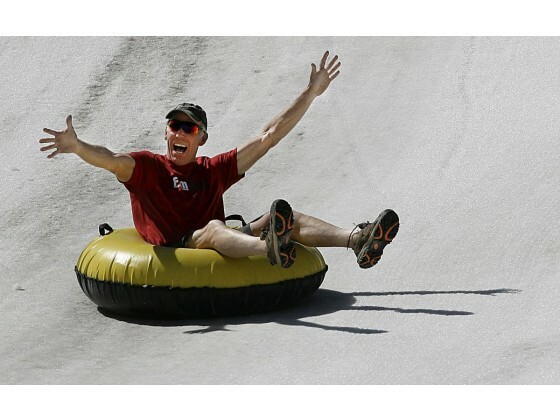 Crezee sped down a snowy slope at Big Bear Snow Play on a yellow and black inner tube, yelling “Wooooo!” as the inflatable spun. “I refuse to grow up,” he said. George’s goal is to motivate the masses to get out and lead an active, healthy lifestyle. He has spoken before classrooms, small community groups and larger audiences including the 2014 Pasadena Council On Aging. If you would like more information or would like to schedule George for an upcoming event, please contact him at GeorgeCrezee@gmail.com. GetOffTheCouchAndGo.com would like to thank the many individuals and organizations who helped to make this day a success. And most especially my family, without whom none of this craziness would be possible: my wife Uli and my children Kyle Crezee and Amber Stockham and their families.